Although there is a plaque in Westminster Abbey, there is no statue to celebrate the achievements of Harrison anywhere in the country or, as far as we know, anywhere else. This will therefore not only be a first for Barrow but for the world and we are approaching donors, both nationally and internationally, for help in raising the balance of the money for the project to go ahead. This page will give regular updates on the progress of the project. If you wish to donate please go to the Donate page or get in touch with Better Barrow. Thank You. 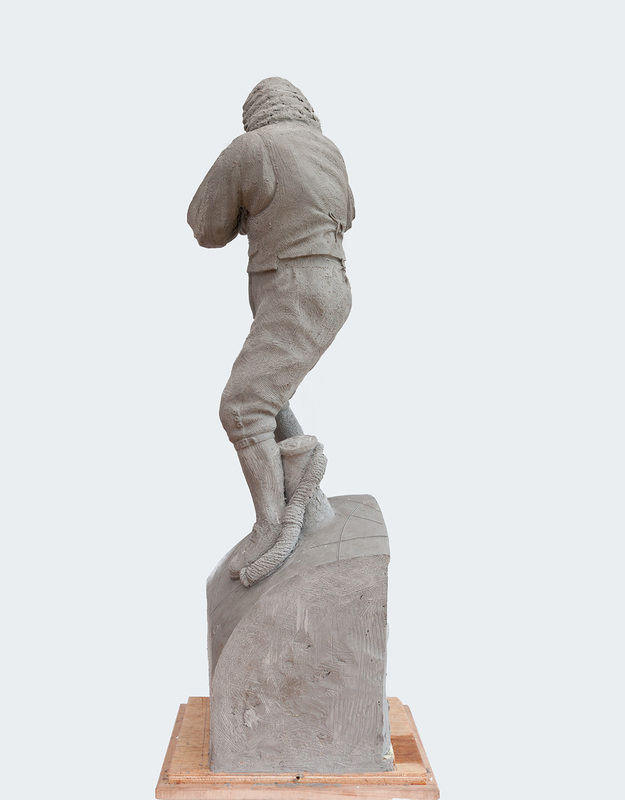 The statue will be life size, made of bronze standing on a stone plinth. Harrison is depicted cradling H4, the watch which was the basis for all subsequent marine chronometers, in his hands. He is winding up the timepiece which would allow mariners to tell the time accurately at sea and enable them to work out their position. 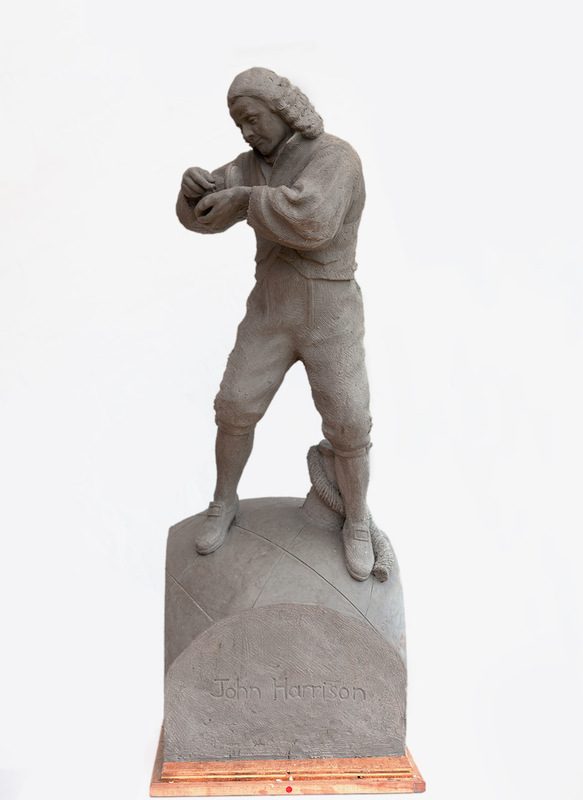 Harrison is shown in working clothes balancing on a section of the globe: symbolising not only his struggle to find the mechanical solution but also in dealing with the vested interests and bureaucracy of the Longitude Board. Just behind the standing figure is a shipís bollard and mooring rope, making the crucial nautical connection between the sea and Harrisonís work. The longitude of Barrow-upon-Humber, where he lived while developing the worldís first marine chronometer, is marked on the globe by lines representing the bi-metallic strip, another important invention of Harrison’s. 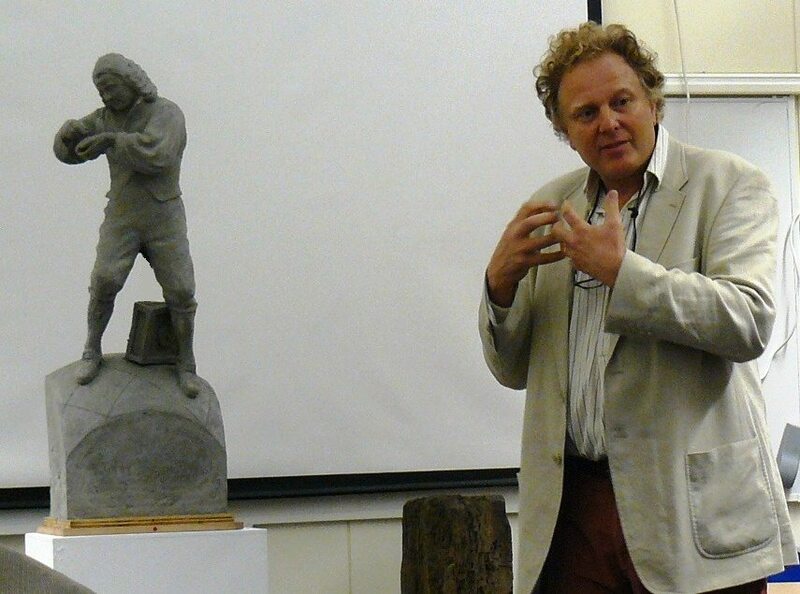 The commission will be carried out by Marcus Cornish, a nationally renowned sculptor who has created works ranging from Paddington Bear at the station to sculptures for HRH the Prince of Wales. 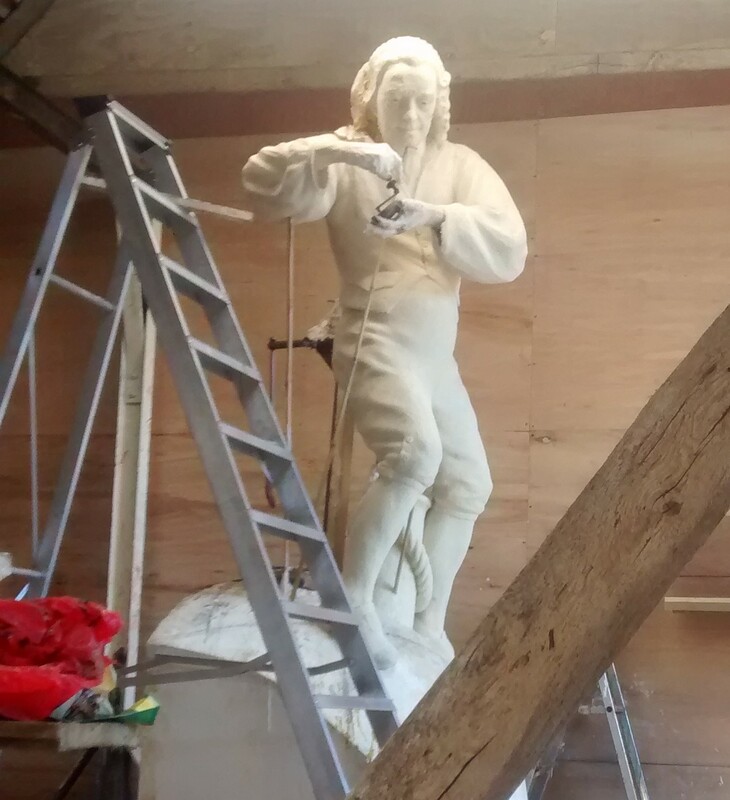 Almost there… we are doing final costings (as far as this is possible) and calculate that, with some income from the sale of clocks from Harrison’s Garden, we will have sufficient funds to install the statue. We await dates from the foundry and the stone supplier for the plinth so we are going to play safe and aim for an installation in September. 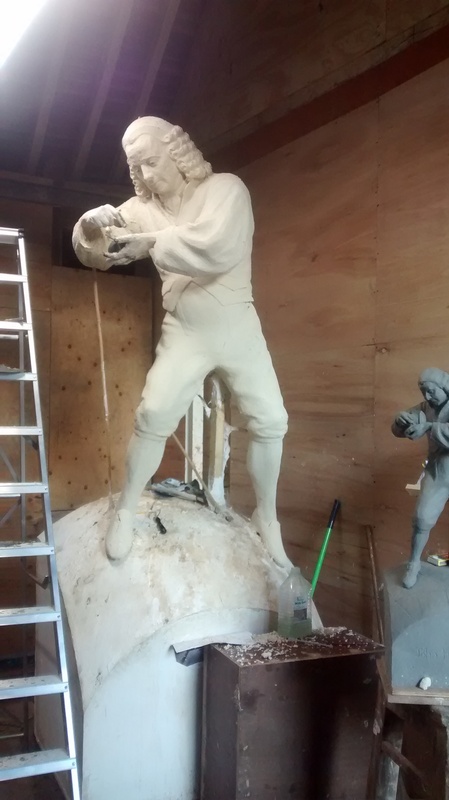 Marcus is progressing well with the statue which is really taking shape now. Sometime in the new year it will be ready to go to the foundary for casting and then we shall begin to have some idea of the date of arrival in Barrow. The contractors who are constructing the foundations have been selected as has the lighting installation company. Having received photos and reports from sculptor Marcus Cornish that work progressing well on the statue, we then had the good news that North Lincolnshire Council has granted planning permission for installation in the Market Place, the village’s chosen location. 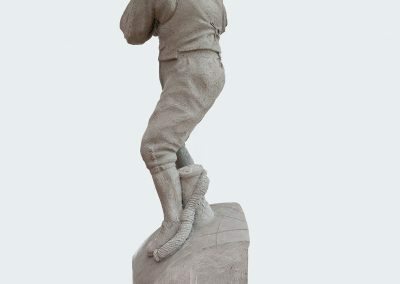 We don’t have a completion date as yet – this will depend on the foundry where the statue will be cast as well as arranging transport for both the statue and the stone plinth, together with the groundwork preparation. We will keep you informed as we progress. 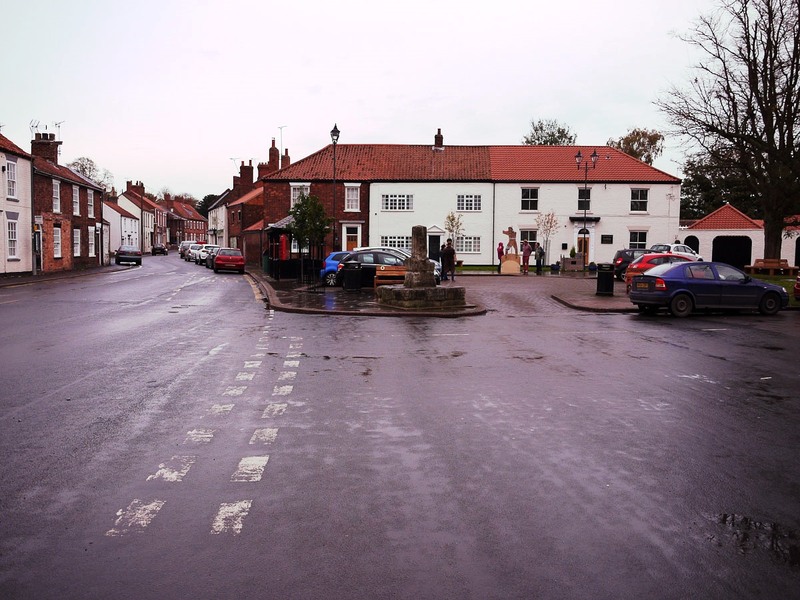 We asked the residents, via this website and our FaceBook page, to complete a survey as to where they would prefer the statue of John Harrison to be located – in the Market Place or on the Church Bank. The survey has now been completed. 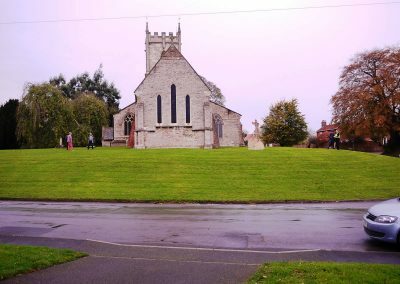 The preference of those who voted or commented on the FB page was 56% in favour of the Market Place with the remaining 44% preferring the Church Bank. 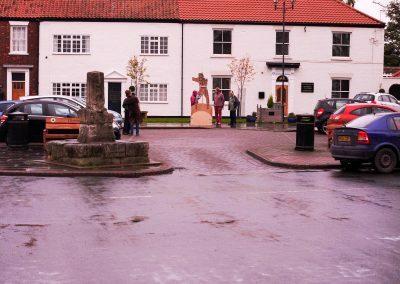 The Better Barrow statue Committee will therefore, proceed to investigate placing the statue in the Market Place with the Church Bank being the fall-back location should the Market Place be unsuitable for any reason. It should be noted that there are many steps and considerations to be undertaken – such as the required foundations, lighting, etc. 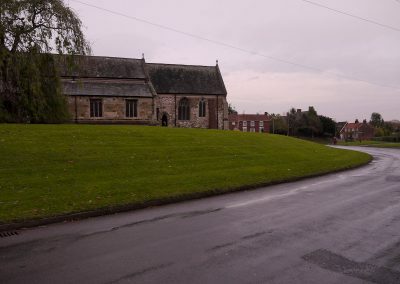 – prior to applying to planning permission, at which point the residents of Barrow will be able to make their views know to the North Lincs Planning Committee. Over the Christmas period Better Barrow’s appeal for the funds required to commission, create and erect the statue was launched. This was covered in the local BBC News. Please see our Donate page if you wish to contribute to the fund. Thank You. 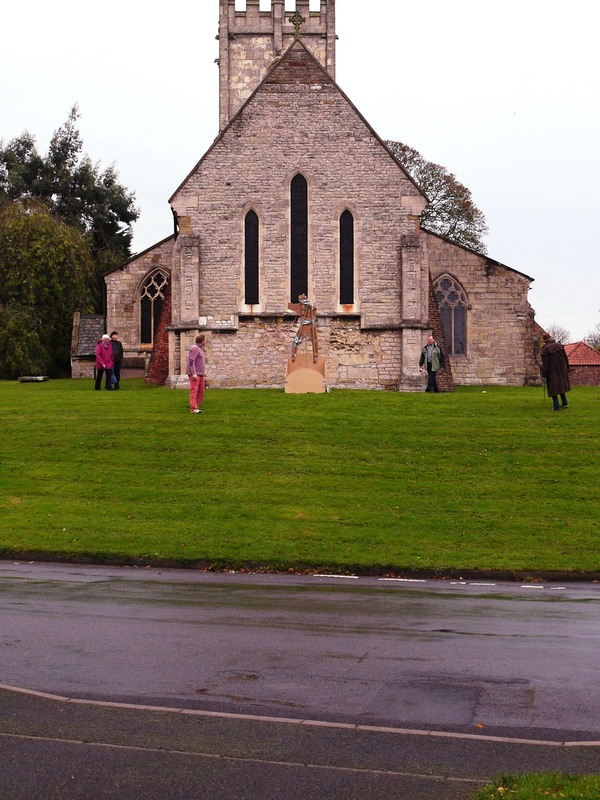 To look at possible locations for the statue’s eventual siting. Marcus has developed the maquette into a more finished version than was available at the selection day, incorporating a number of suggestions that the BBCP had given him. 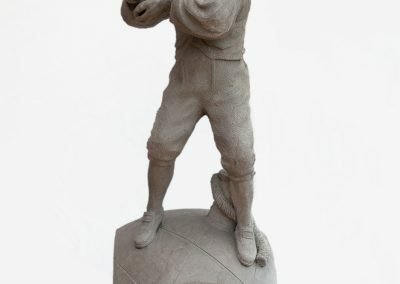 As well as a cleaner finish, the clothing had been developed based on original garments that had been loaned to Marcus and a ship’s bollard with rope entwined around it had been added to emphasise the marine connection (this also acts as added security – making it more difficult for the statue to be stolen for scrap metal). 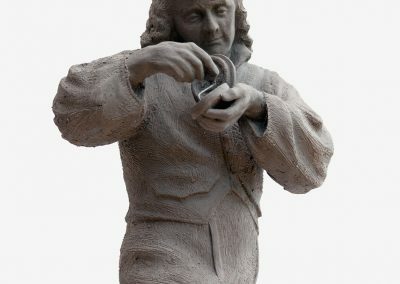 The images below show three views of the maquette as well as Marcus making some on-site modifications to the rope (please click on the images to see them properly). The area around the Holy Trinity Church. 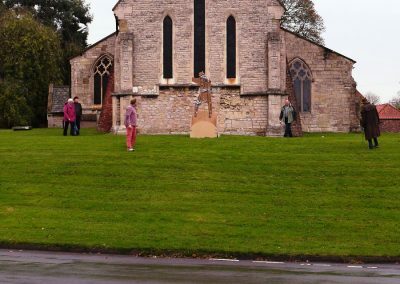 While we now have an idea of what the statue would look like in both locations there are a number of other factors to take into account before making any decision. While the BBCP are commissioning the statue we do not own the land on either of the two locations. The Market Place is owned by the Parish Council and the land around the Church is owned by the CofE. We therefore need to agree with both parties on matters such as final ownership of the statue, the necessary ground work to be carried out on both locations, installation of additional lighting, etc. 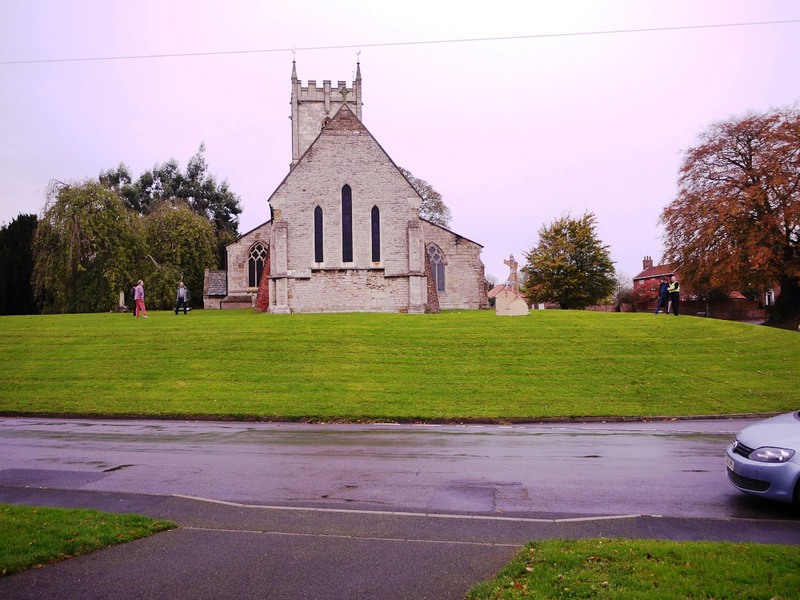 In addition, since both sites are within the Conservation Area there will be various planning procedures we need to follow – as a starter we need to discuss with the North Lincs Conservation Officer what steps he thinks will be necessary to achieve permission at both locations. Once we have a clearer understanding of the factors and procedures associated with both locations we will come back to the village with more details on the two options. The desire for a statue of Harrison arose from the original questionnaire and consultation in the village about what people would like to see in Barrow, especially in the Market Place. 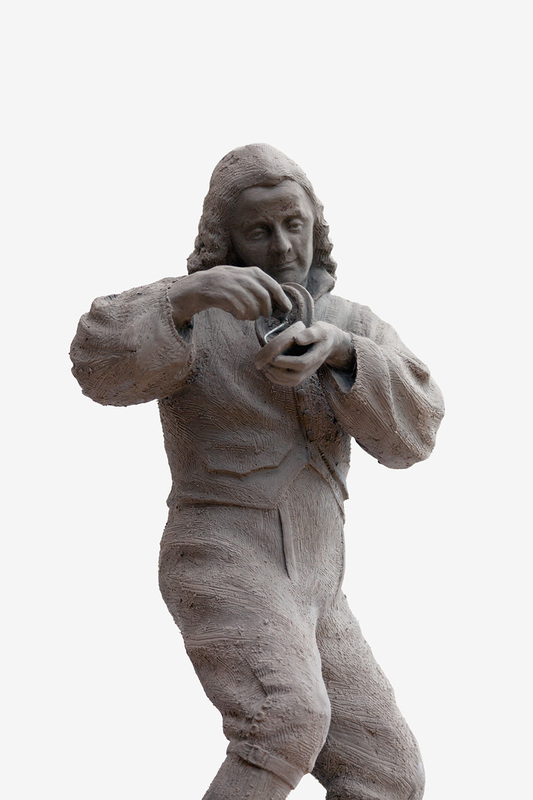 A statue celebrating John Harrison was high on people’s wish lists. 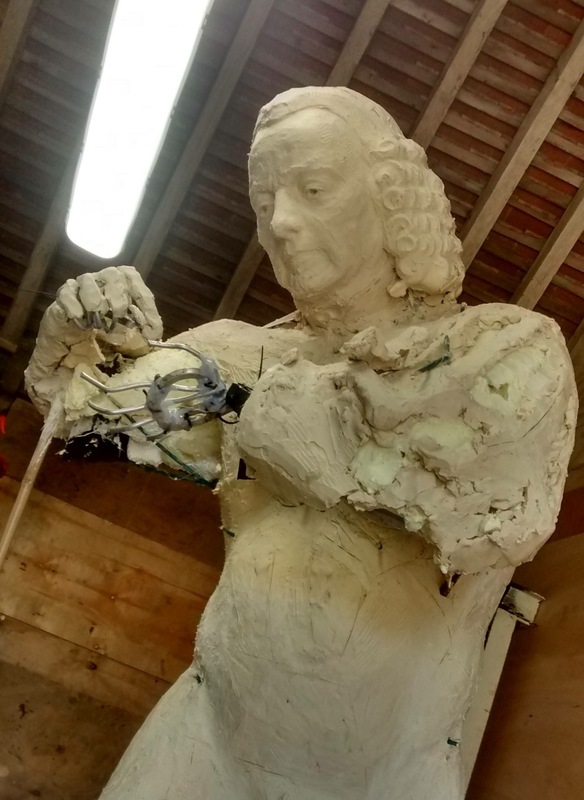 Having researched possible artists and consulted widely – including discussions with the Larkin Society which was responsible for the statue of Philip Larkin in Hull Station – three sculptors were short-listed. 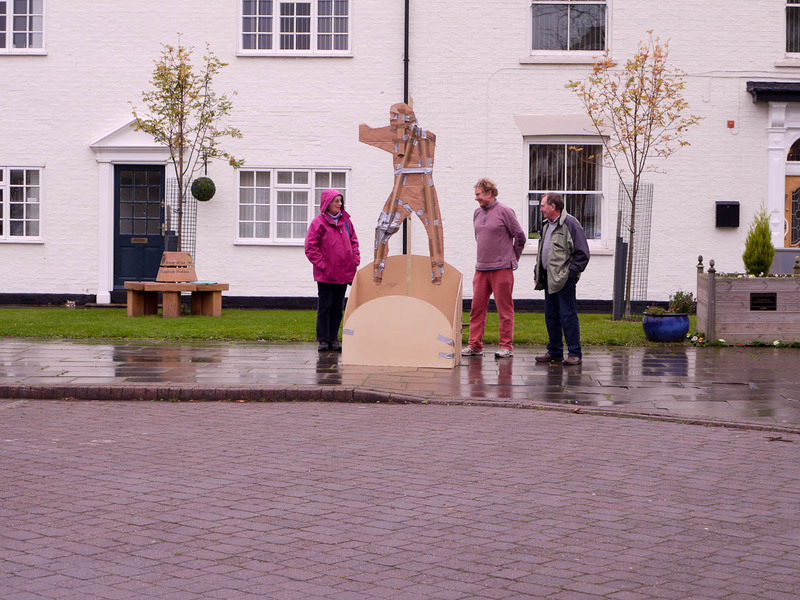 Each submitted a maquette – a small version of the final piece – and gave a presentation to an invited panel (see below for a list) as well as being interviewed by the Better Barrow trustees. Following this, a public consultation was held and Marcus Cornish’s design was chosen. Feedback indicated that people were impressed by the depiction of Harrison as a working man, always active and focused on finding a solution to the problem of longitude. He is portrayed in his working clothes, carefully winding H4. They also liked the representation of the globe beneath his feet, referring both to his work and to his worldwide importance. 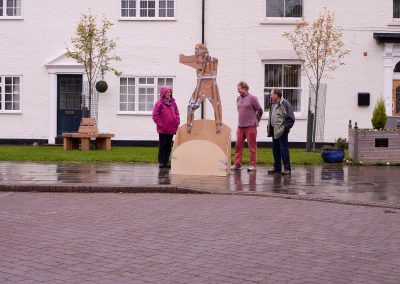 There will now be much more detailed discussions with Marcus about his work and the siting of the statue, whether in the Market Place or near the church. In addition, of course, we will be preparing publicity and fund-raising information for the next stage of the project.